In between wind-driven rain the sun shines. There is an avenue of trees lining the approach to our local public library branch. After school on Thursday I drove there for the particular purpose of taking a few photos. The leaves tossed prettily in the wind. It won't be long before they are all dry and scuttling on the ground like evasive crabs. The above lines of poetry are perfect for October around here. We've had our summer, and the October nights are getting wilder with wind, rain and leaves. Such pretty colors and I hope that they last longer for you to enjoy. It gets frustrating when they fall too soon. So lovely . . . I have been enjoying the fall colours so much. I must confess that I enjoy the October eves far more than I do the summer evenings. But I am not sure whether I liked better the lines of poetry or your own poetic phrasings as you described the photos in your mosaic. Your autumn mosaic is just stunning! 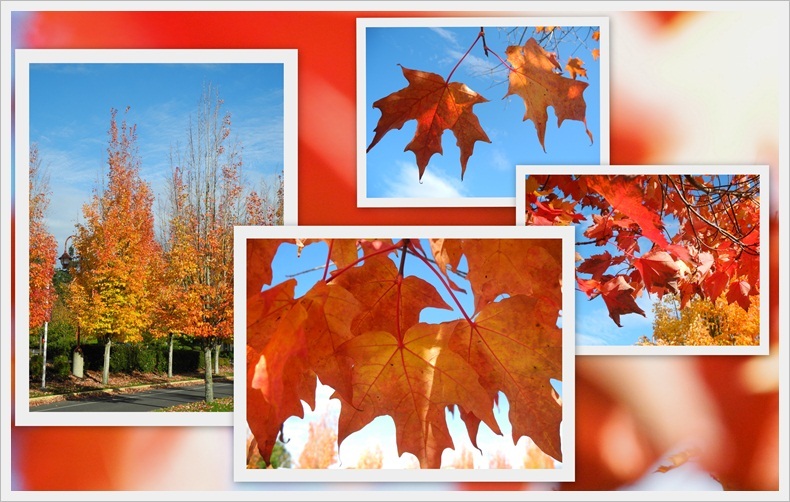 Beautiful maple leaves. I'm visiting from Mosaic Monday. I am entry #24 and hope you will stop by for a visit. Your collage is so beautiful Lorrie. It's such a nice idea to highlight your collage with a quote! Beautiful collage, Lorrie! Orange trees leaves like these are my favorite color. Wow that's a bright and cheerful mosaic! Love that red hue! Wonderful! I think this is the week you are teaching or doing the library --or was it last? Anyway, have a good week! What a pretty composite! I love it! Oh, Perfect! I love those lines. lovely words and images - I love this - "The leaves tossed prettily in the wind. It won't be long before they are all dry and scuttling on the ground like evasive crabs." Enjoy your remaining days of autumn, as we approach summer here. Thanks for stopping by my blog for Mosaic Monday. Yes shutter priority versus aperture can be a challenge. I used AP for a long time before I gave shutterP a go. Give it a try. I just experiment with different speeds and then look at the results. The bonus of digital is it doesn't matter how many pics you take, and sometimes you come up with something stunning. Have fun! Great Fall colors - So Pretty! !